In April 2006, over 100 workers from a suburban Detroit automotive parts supplier plant were laid off. Many of them had spent between five and 20 years at this company. 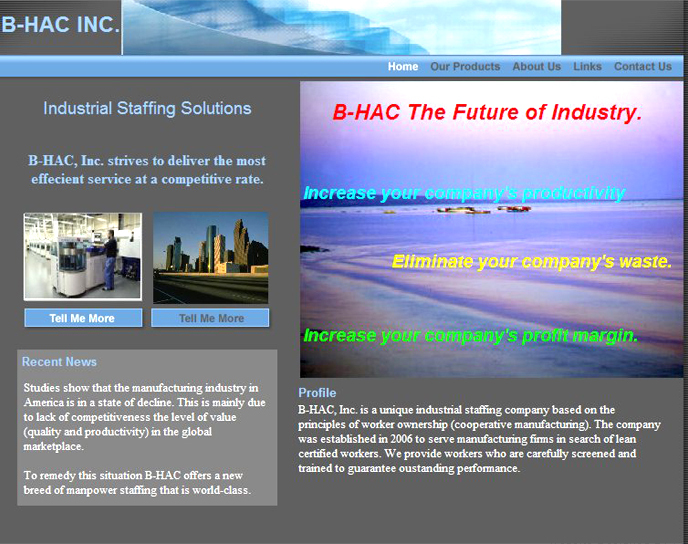 A few of the individuals decided to empower themselves by starting their own company, B-HAC, a staffing company that trains and provides lean certified workers for manufacturing plants. None of the team members had any entrepreneurial experience whatsoever, but they were determined to make a go of it. That’s when B-HAC got involved with the ALPHA FOUNDATION (AF) team who provided the initial Business Plan coaching as well as assistance with marketing. After a difficult one-year period of intensive training and marketing, the company earned its first contract. Now, B-HAC had a contract but no start-up capital to meet its initial obligations. Bank loan applications were repeatedly turned down because B-HAC was a start-up company and had no collateral to show. Alpha Foundation stepped in again and provided a micro-credit loan of $5,000 to the company as well as mentoring and support on an ongoing basis. The loan was paid back in full within five months and B-HAC has been on a steady growth curve since then.